The Virtual CD-ROM Control Panel lets you mount an ISO file from which you can easily install that file’s application. It’s always better to simplify tasks, or even skip a step when you can. Windows 8 can handle ISO disk image files natively, so you can directly install the application stored within the file. Unfortunately, Windows 7, Windows Vista and Windows XP can’t do that. These three older versions of Windows can, however, tap into that capability through the free Microsoft Virtual CD-ROM Control Panel. This utility lets you mount any ISO file as a virtual disk drive, so you can install the associated application without having to burn the file onto a CD or DVD disc. The tool itself has been around for years, but Microsoft recently updated it to confirm compatibility with Windows 7 and other more recent versions of Windows. The Virtual CD-ROM Control Panel does have one limitation. It only supports 32-bit versions of Windows. The older Windows driver it uses isn’t compatible with a 64-bit OS. 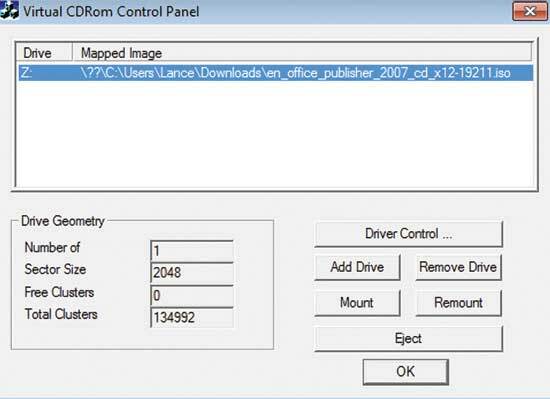 Download the Virtual CD-ROM Control Panel from its page at the Microsoft Download Center. Run the file winxpvirtualcdcontrolpanel_21.exe, which is a self-extracting executable. Choose where you want to save the extracted files. You should find the following three extracted files: VCdControlTool.exe, VCdRom.sys and readme.txt. VCdControlTool.exe launches the utility, VCdRom.sys provides the driver and the readme.txt file contains instructions on how to set up the utility. Following the steps in the readme.txt file, copy the VCdRom.sys file to the windows\system32\drivers folder. This step will require administrative privileges. Launch the Virtual CD-ROM Control Panel through the VCdControlTool.exe file using the Run as Administrator command. Once the utility is up and running, click on the Driver Control button and then click on the Install Driver button (see Figure 1). Browse to and select VCdRom.sys in the windows\system32\drivers folder, and then click OK. Figure 1 Install the Virtual CD-ROM driver. One note: In Windows 7, the utility was unable to access the driver if I copied it into windows\system32\drivers. Instead, I copied it to the Windows folder, and it worked fine. Click on the Add Drive button (see Figure 2). Windows assigns an unused drive letter to create the virtual disk drive. Then click on the Mount button (see Figure 3). 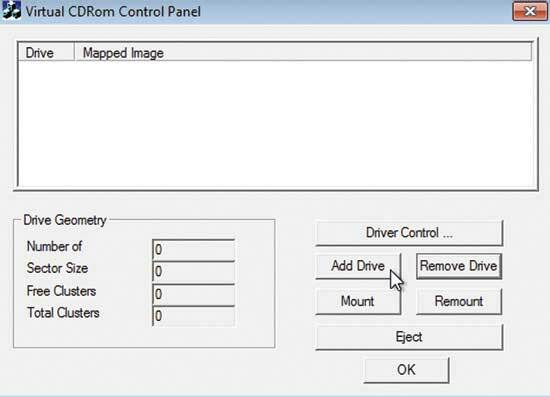 Select the mounted drive in the Virtual CD-ROM Control Panel window. Browse to and select the ISO file you wish to mount. Figure 2 Select Add Drive to assign an unused letter to the virtual drive. Figure 3 Select Mount to activate the drive. 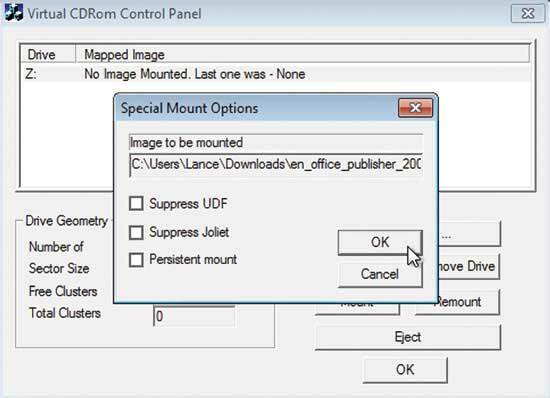 Leave all the options unchecked in the Special Mount Options dialog box (see Figure 4). Click OK. You should now see the drive mounted with the name of the ISO file (see Figure 5). You can then leave the Virtual CD-ROM Control Panel open or click OK to have it closed. Figure 4 Don’t select any of the special mount options. Figure 5 Now your drive is mounted with the ISO file name. Your virtual drive should now appear in My Computer or Windows Explorer. Double-click on the drive to install the actual application. After you’ve installed the application and no longer need the drive, return to the Virtual CD-ROM Control Panel. 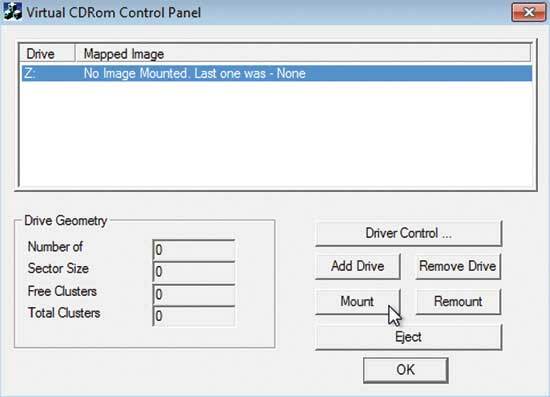 Select the mapped drive, click Eject and then click Remove Drive to remove the mapping. In my testing, the Virtual CD-ROM Control Panel performed without a hitch in Windows XP. This is no surprise, as it was originally designed for Windows XP specifically. Running this utility in Windows 7 or Windows Vista does require an extra step, however. In Windows 7 and Windows Vista, the tool sails through the various installation and setup steps, but doesn’t display the mounted drive within Windows. Fortunately, you can still access the drive through a command prompt. In either OS, open a command prompt as an administrator. Type the letter of the mounted drive. You should see the list of its files (see Figure 6). Run the appropriate .exe or .msi file from the prompt to install the ISO file’s application. Figure 6 You can see the list of files on a mounted drive with a command-line prompt. On the client site, the Virtual CD-ROM Control Panel supports 32-bit Windows 7, Windows Vista and Windows XP. On the server side, it’s compatible with 32-bit Windows Server 2003 and Windows Server 2008. 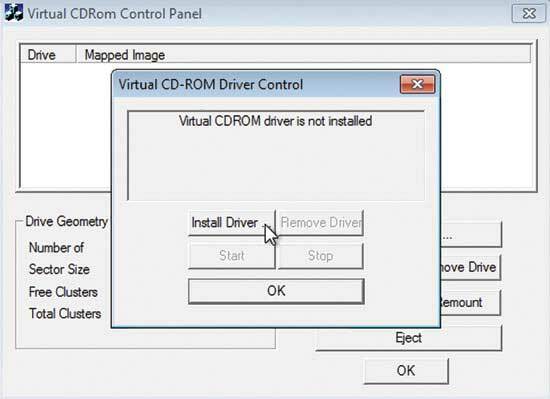 Even with the extra steps required if you’re using Windows 7 or Windows Vista, the Virtual CD-ROM Control Panel is still a handy tool that can greatly expedite application installation. Lance Whitney is a writer, IT consultant and software trainer. He’s spent countless hours tweaking Windows workstations and servers. Originally a journalist, he took a blind leap into the IT world in the early ’90s.